The Laban/Bartenieff Movement Studies (LBMS) is an essential tool for any work with movement and dance in education, art or therapy. It allows conscious movement experience and increased expression. Rudolf von Laban (1879-1958) was a dancer, choreographer, painter and movement researcher who also was involved with architecture, geometry, mathematics, and other sciences. Laban wanted to capture movement in its entirety. To do this he differentiated between the spatial, body-related and the dynamic aspects of a movement and examined their interaction. What Laban developed early this century in Germany and England in the context of expressive dance continues to be developed worldwide by his students. In the United States, Irmgard Bartenieff (1900-1981) laid the foundation for the upkeep and the development of his work. She developed a corrective body-work, the Bartenieff Fundamentals, from Laban Movement Studies and her experience as a dancer and physical therapist. Each movement contains these categories. The goal of the work with LBMS is to experience, observe, understand and create the different aspects of a movement. An essential part of LBMS is the bodywork of Irmgard Bartenieff. 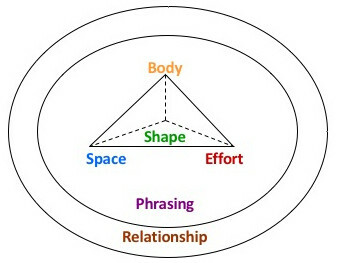 The Bartenieff Fundamentals are basic sequences activating the body's connections and strengthening the expressiveness of the body. Movement principles and coordination patterns become consciously experienceable. Our teaching methodology connects practical movement experience with theoretical knowledge. In this way the students will develop their movement competence and comprehension of movement. published by MoveScape Center, Devner CO, USA.